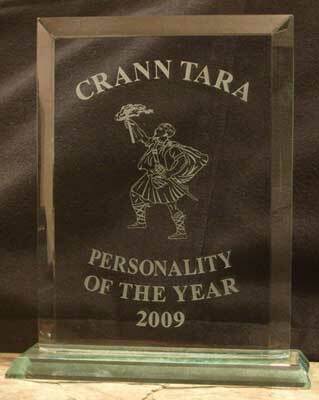 2009, not just the end of a year, but the end of a decade, but like no other Crann Tara choose a personality who is considered a worthy recipient of their annual award. This year’s winner of the award was again chosen from numerous potential candidates, all of who had shown everything that was deemed essential and necessary in all aspects of promoting Scotland to be included in the running for the award. The final decision to who should receive this year’s award is never taken light heartedly, but this year’s decision was particularly close and was only decided in the final day of voting, but there could only be one winner in the end. It is unfortunate that there is only one award a year of this kind as there are so many worthy of it, but this is what makes it so special. For the past two years the accolade has been awarded to an individual, but this year is a first by going to a duo who for their contribution to Scotland by way of their music a contribution which has made Scotland much richer place. This year’s award was presented to The Corries, which consisted of Ronnie Browne & Roy Williamson. Sadly Roy passed away on August 12th 1990, so the award was presented to Ronnie on behalf of them both. The Corries were a Scottish folk group that emerged from the Scottish folk revival of the early 1960s. It was in the Edinburgh College of Art in 1955 that both Ronnie & Roy first met and a partnership was to flourish which was to last for over 30 years. Although the group was a trio in the early days, it was as the partnership of Ronnie Browne and Roy Williamson that it is best known. Their first performance as a duo was in the Jubilee Arms Hotel, Cortachy, Angus. The reception and response was so great that it encouraged them to continue as a duo. Their reputation began to grow, as did their exposure on television, and the first series they did as a duo was innovative in its presentation of folk music. They became involved in the BBC series "The White Heather Club”,which began in 1958, it featured other Scottish greats such as Andy Stewart, Jimmy Shand and his Band, Robin Hall and Jimmie MacGregor. Instead of performing in front of an audience they were filmed in locations associated with the songs, the Hills, Glens and numerous Historical places around Scotland like the "Braes o' Killiecrankie" which was sung as they walked through the Pass of Killiecrankie, and so on. They were effectively pioneers of the music video. Both Ronnie & Roy had a talent to play an array of instruments and often did so complimenting their performances where ever they went. Roy was a skilled woodworker and in the summer of 1969 he invented the 'combolins', two complementary instruments which combined several into a single instrument. 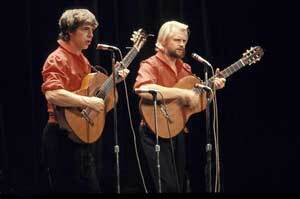 One combined a mandolin and a guitar (along with four bass strings operated with slides), the other combined guitar and the Spanish bandurria, the latter being an instrument Williamson had played since the early days of the Corrie Folk Trio. The idea was originally conceived as a way to combine several of the many instruments they carried around on tour - the Corries' long row of chairs behind them on stage bearing instruments is legendary - the combolins in fact became an additional two instruments for the tour van. The early 1970s were the Corries' finest hour. They had several albums in the top 50 album charts in Scotland, and released a single "Flower of Scotland" (1974). It was quickly adopted by supporters of rugby and footaball as the unofficial national anthem and is still used at Scotland's international matches today. Their concerts frequently had the audience joining in with the chorus of songs, even without prompting. The Corries became closely identified with songs about Scottish heroes and events from Wallace to the Jacobites, celebrating the final years of clan loyalty and military courage. In 1977, Peat Fire Flame was released which saw a move towards love songs and celebrations of the landscape. During the Corries' 1989 tour, Roy Williamson's health went into decline and he was diagnosed with a brain tumour. He spent his last years living in Forres, close to where he spent his school years. He died on 12 August 1990. Ronnie Browne continued recording and moved into acting, as well as expanding his career as a noted painter, including commissions for the 1990 Scottish Rugby team's Grand Slam victory. He toured as a soloist for a few years after Roy’s death, and even released a solo album, but then put himself into retirement from performing. On August 23rd 2005, Ronnie was convinced to come out of retirement for a day to sing at the 700th anniversary commemoration to the execution of WilliamWallace in St Bartholomew’s Church, Smithfield Market, London. Although an emotionally charged occasion Ronnie showed his true professionalism to sing the Corries hit “Flower of Scotland” in front of a packed 300 patriotic congregation. 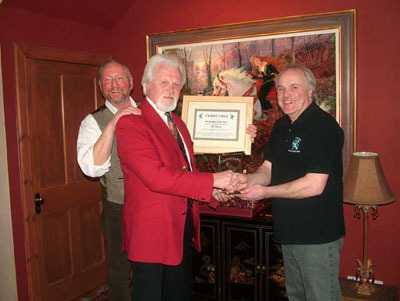 In December 2007, The Corries were inducted into the Scottish Traditional Music Hall of Fame at the Scottish Trad Music Awards in Fort William. Today the music of the Corries continues to be listened to world wide, bringing inspiration and passion not just to Scots, but ex pats, folk of Scots descent and folk who have a love for Scotland leaving in their music a legacy which will never die. Having recognised The Corries for their life’s work, which has constituted in Scots the world over rekindling their patriotic values through listening to their music. It was an honour and a privilege that Crann Tara was proud to present a certificate and a special glass plaque uniquely engraved with the Crann Tara logo on it to someone so worthy. The presentation was gladly accepted by Ronnie from Crann Tara on behalf of both himself and Roy. The presentation was a small intimate affair with 2008 winner Ted Christopher presenting Ronnie with the award. The award is a one of a kind with the Crann Tara logo etched on the glass and it was a privilege for us to have Ronnie accept the award on behalf of both himself and Roy [The Corries]. A special thanks to Alan Herriot for welcoming us into his home and studio for our presentation as well as his kind and generous hospitality. Below is a letter received from Ronnie with regards to the presentation. It was indeed a pleasure meeting you, Ted, Alex and Alan on Tuesday, and I now offer my formal thanks to you all for travelling fae a' the airts to make the presentation of your 'Personality of the Year' award to The Corries. Of course I include Roy in these thanks, he would have been as proud as myself to receive it. It is very humbling to think that what we did during our career for pleasure and financial gain apparently has reached out to so many hearts both here in Scotland and, so it seems, throughout the world. I thank all of your membership who voted us into the receipt of this year's award, and a wee special thanks to Alan Herriot who so kindly made his hoose available to us for the presentation. I close with my warmest greetings to Crann Tara.